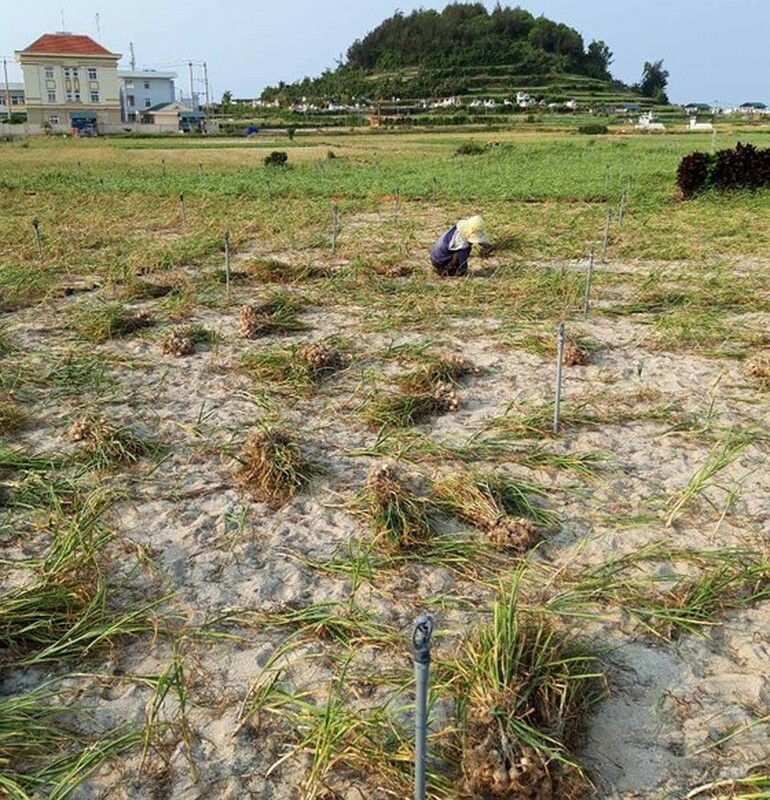 Farmers in the island district of Ly Son have entered the harvest time of the winter-spring garlic crop these days but they have a poor crop due to prolonged hot weather. Garlic needs constant watering for bulb formation. However, due to hot weather and diseases, garlic plants grew weakly and gave low production. According to Mr. Co, the price of fresh garlic was VND30,000 per kilogram at the beginning of the crop. The price now has risen to VND45,000 per kilogram, but because of lean harvest, farmers still suffer losses. 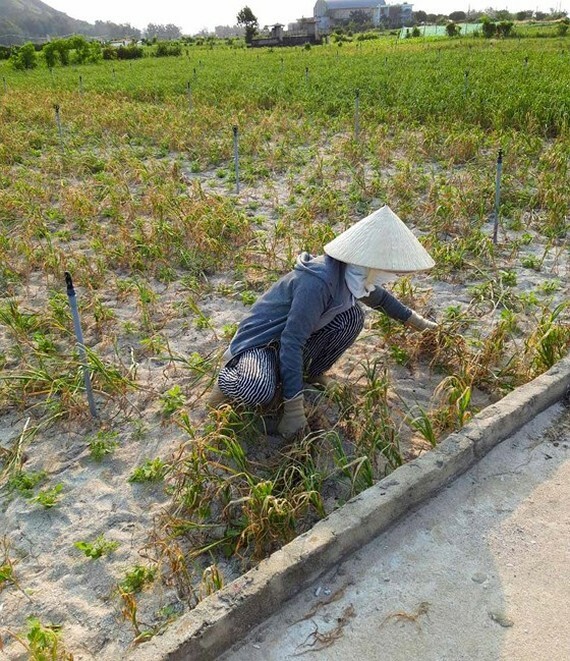 Similarly, Ms. Huynh Thi Tuyet also cultivated garlic on an area of 1,500 square meters but only managed to harvest nearly 500 kilogram of fresh garlic. Last year, she collected 1.2 tons of fresh garlic on the same field which means this year’s production merely accounts for nearly 50 percent of last year’s. 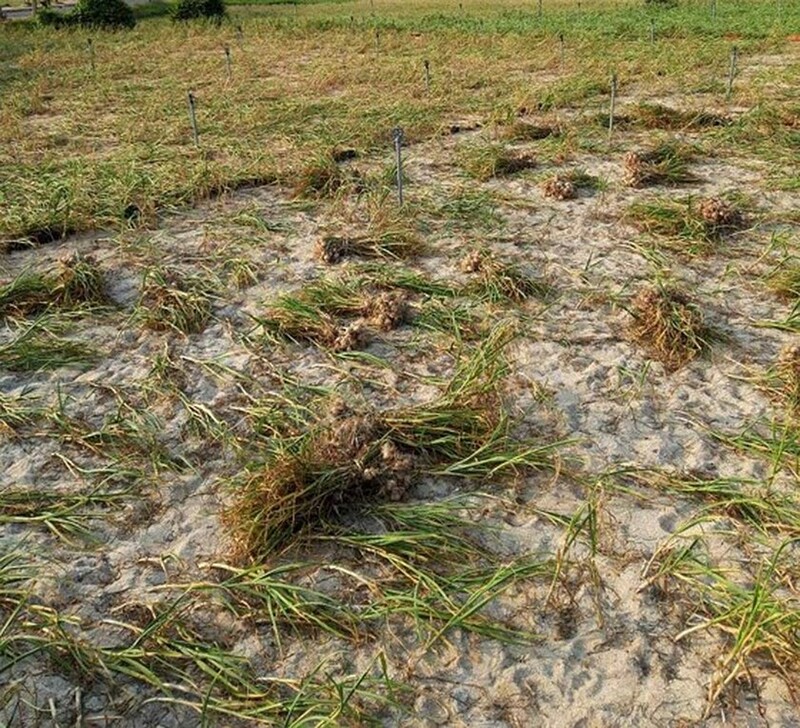 She has suffered a loss of VND18 million for her garlic field. In order to save the costs for hiring laborers, her family members have to harvest garlic on their own. Hot weather has caused a shortage of water so farmers have to work very early in the morning when the sun has not risen to water their garlic field to make use of high level of underground water and dew during this time of the day. However, they can only water their garlic fields once every four or five days as they have to save water for other crops. Mrs. Pham Thi Huong, vice chairwoman of the People’s Committee of Ly Son Island District, said that the price of garlic was from VND40,000 to VND45,000 per kilogram this year but garlic production was low due to bad harvest. Currently, local authority is in the progress to check the situation of garlic cultivation. If hot weather continues to prolong and there is a shortage of water, local authority will instruct farmers to switch to grow other crops. Farmers usually grow shallots after the crop of garlic. However, due to drought, this year, most farmers have shifted to grow mung beans and corns which require less water. In addition, in order to prevent the groundwater depletion on the island, local authority ordered farmers not to drill more wells and will carry out inspection at existing wells constantly.